I first dined at Wolvesmouth about a year ago and it was one of the more memorable dining experiences of the year. I almost never get to see this caliber of cooking up close, and I found the process to be as intriguing as the food itself. 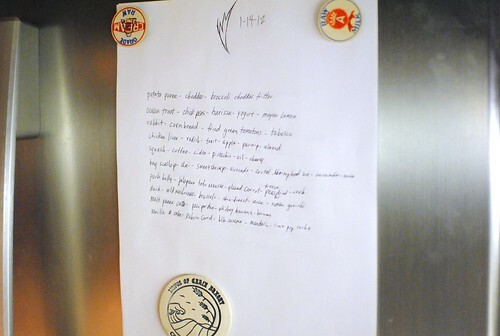 Since then, I’ve dined at Wolvesmouth’s streamlined Beer Belly event as well as the gluttonous 40-course event, but this was my first trip back to the “standard” ~10 course setup. There was a fortuitous (for me) last-minute cancellation, and I jumped at the chance to fill in. The ever-changing menu is posted on the refrigerator, an amalgamation of what’s fresh at the farmers and fish markets (and meat purveyors), combined with whatever ideas come up in Craig Thornton’s head. 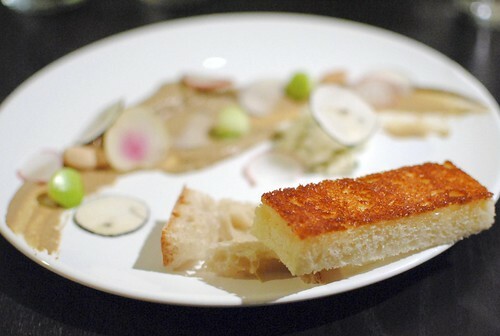 While always different, the menu is reliably interesting, displaying varied flavors and techniques. We started with this dish. The puree was very thick and rich, likely from the added cheese, and it definitely had a potato flavor kind of resembling a richer mashed potato. 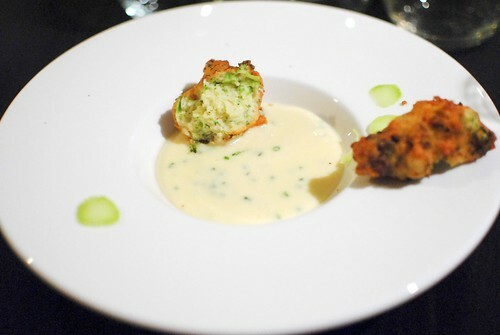 The fritter was tasty, fluffy and airy, with a little bit of texture (I think from the broccoli stems?) that worked quite nicely. Some lime juice was a nice touch to cut through some of the richness. 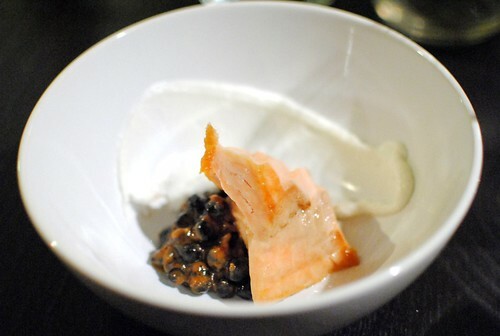 The trout here was cooked well, and I thought the hearty chickpeas helped add some body to the dish. Yogurt and meyer lemon provided some tart acidity. 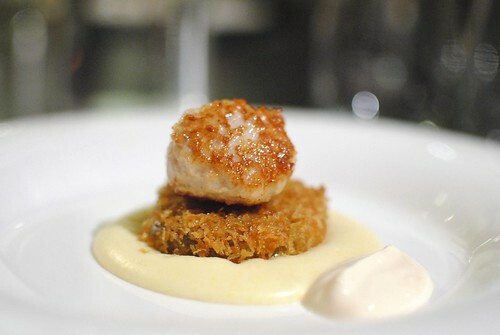 Here, pureed cornbread polenta was topped with a slice of fried green tomatoes and a rabbit meatball. Interesting. The sweetness from the cornbread and tomatoes worked well with the savory meatball, while a touch of tabasco aioli really brought everything together. 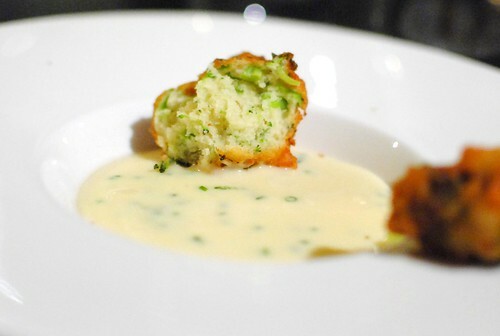 The delicate crunch of the tomato’s batter was pretty nice too. 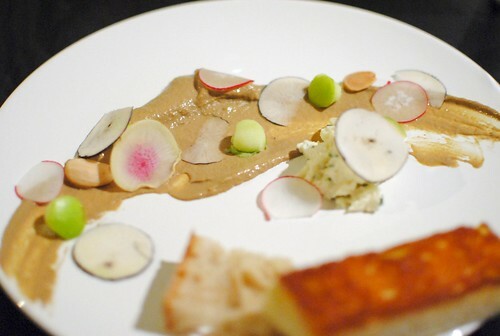 The fresh bite of radish and green apple was integral here, complementing the rich mineral flavor of the liver. Some almonds added a nuttiness and crunch, while there were two different breads available for spreading. I liked the fact that this squash was roasted, bringing out a little more of the sweetness. The coffee cream added a lot of depth, while pistachios added a nutty texture. Some tart cherries completed the bites. This was another very interesting dish, with flavors of a shrimp cocktail and a seafood salad. The shrimp head ice was very intriguing; it was cool, refreshing and slightly spicy at the same time. 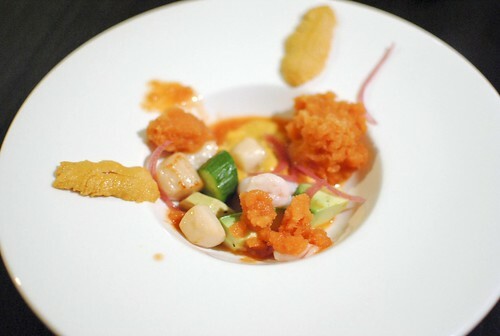 Tomato and a little bit of sea flavor were the primary complementary flavors with the seafood. I also liked the meaty avocado and the cool crunch of the cucumbers here too. I caught these slabs of meat coming out of the oven. Nice! 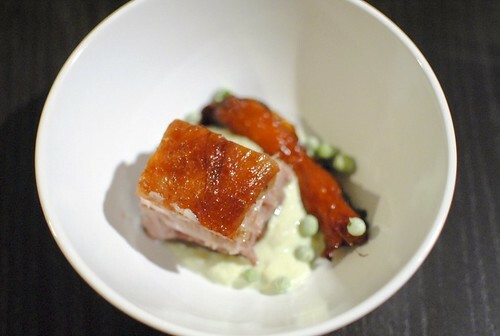 When I saw the large slab of pork belly in the immersion circulator, I knew we were in for a treat. 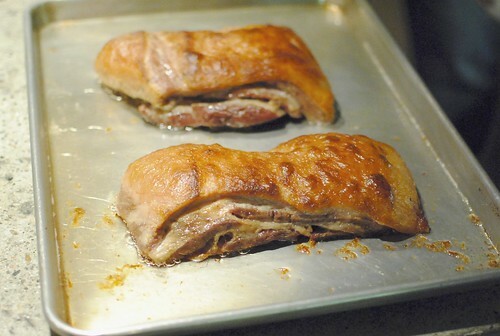 Cooked sous vide then crisped in the oven, the pork was luscious and succulent. However, I thought the skin could’ve been crispier – it was a little limp. 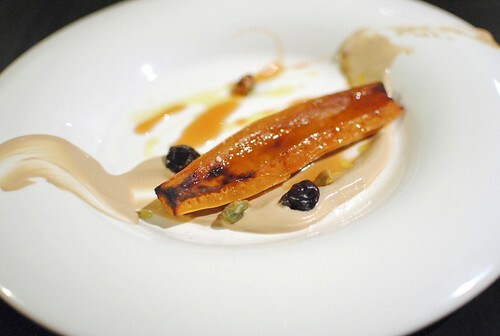 The crunchy, glazed carrot was a nice accompaniment with a subtle maple flavor while the jalapano tofu mousse provided a very mild heat and creaminess. Lastly, freeze dried peas added some delicate texture. 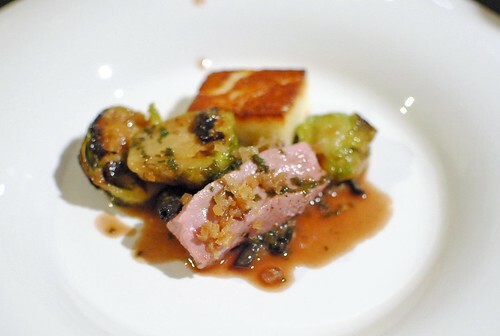 The last savory dish was this piece of duck breast, served with brussels sprouts and gnocchi. The duck was flavorful and tender, but the skin wasn’t as crunchy as expected (diced and sprinkled on top of the duck), similar to the pork. 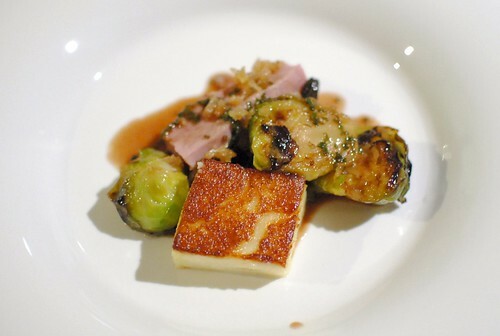 I liked the balance of sauteed brussels sprouts and gnocchi with the duck though. I found the wolf surveying the kitchen. The panna cotta clearly showed off the malt flavor, and I liked the warm French toast to go along with the cool treat. 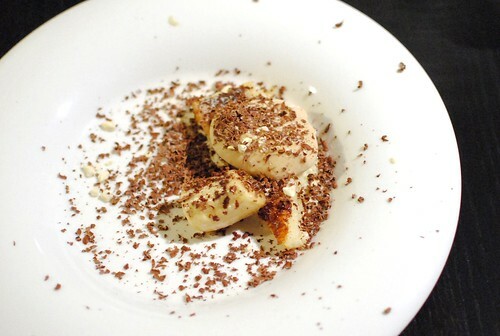 Warm bananas and grated chocolate completed the dish. 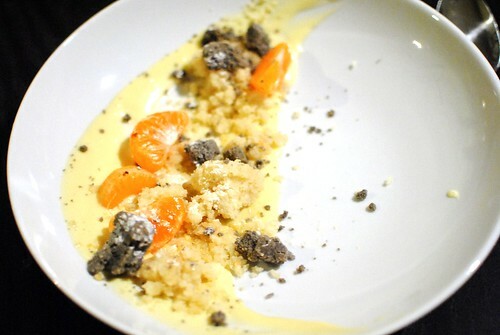 This dessert was a work of various textures and citrus. The kabosu curd and mandarin slices were the fresh, fruity base while the black sesame crumble and pound cake were the bulk of the body. Lime pop rocks were a fun addition too. This was rather light and a nice way to end the meal. This meal was on par with my first Wolvesmouth experience. I think around 10 courses is ideal; each plate is substantial on its own, while still showcasing a diverse example of Thornton’s cooking. 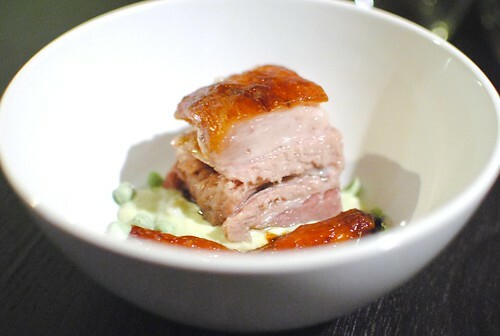 For me, the highlights were the fritter & potato puree, rabbit, pork belly and the last dessert. 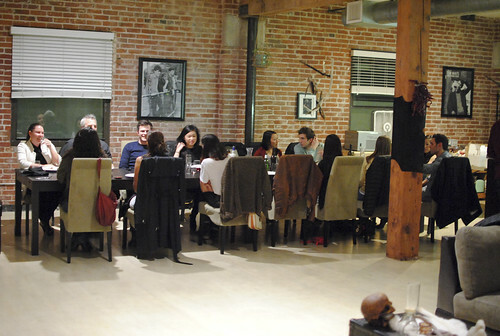 Considering the dinner as a whole, it’s easily still one of the unique and tasty experiences in the city. Looks amazing! 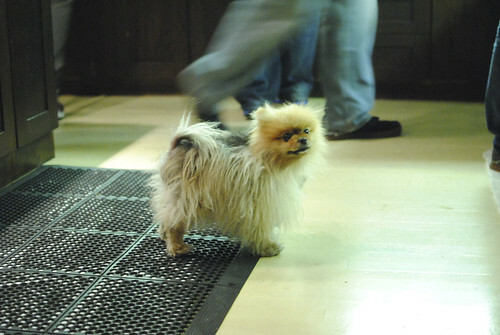 And that dog is ADORABLE. About to head to Portland OR in a few weeks… do you know of any underground dining joints I should check out? Hi Steven…hmm unfortunately I don’t know much about the underground dining scene in Portland.